This week marks the beginning of a 19th-century literature class I’ll be teaching at a local senior living development (center? resort? 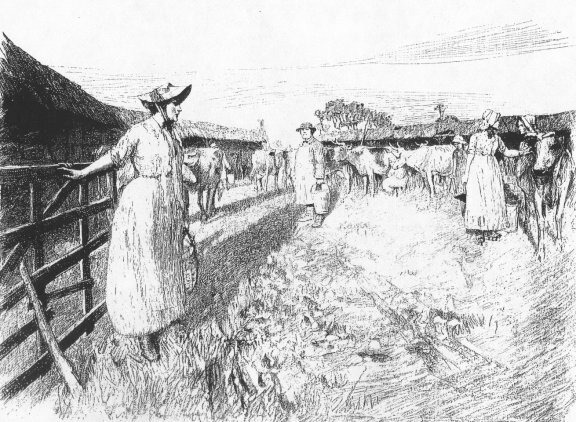 ), and one of the books we’ll be discussing is Thomas Hardy’s Tess of the D’Urbervilles. Writing toward the end of the 19th century, he recorded the decline of pastoral, rural England at the hands of the Industrial Revolution and the railroads. Anyhow, in Tess, the eponymous heroine travels a ways from her hometown to get away from her shady past. She ends up working at a dairy called Talbothays, which Hardy describes in Edenic terms. It’s summer. It’s green. It’s lush. She falls in love with a fellow named Angel. Tess: Londoners will drink it at their breakfasts tomorrow, won’t they? Strange people that we have never seen. Angel: Yes, I suppose they will. Though not as we send it. When its strength has been lowered, so that it may not get up into their heads. Tess: Noble men and noble women, ambassadors and centurions, ladies and tradeswomen, and babies who have never seen a cow. Angel: Well, yes; perhaps; particularly centurions. Angel is laughing at Tess’s inclusion of “centurions,” but there are two jabs at us urban folk here: we can’t handle full-strength dairy products and need them watered down, and most of us have never seen a cow up close and personal. For Heaven's sake, pop thy hands under the pump, Deb! Upon my soul, if the London folk only knowed of thee and thy slovenly ways, they'd swaller their milk and butter more mincing than they do a'ready; and that's saying a good deal. Or maybe not, now that the cleanliness of our surroundings has given us wimpier immune systems. Certainly 19th-century Londoners never imagined there could ever come a time when people were not exposed to enough dirt! Cheesemaking and -mongering is no easy way to make a living nowadays, competing against vast, industrialized outfits (ever visited the Tillamook factory?). And the numbers and varieties of dairy providers at the Bellevue Farmers Market have changed over the years, but re-reading Tess made me think those small outfits should bolster revenues with weekend dairyman/maid retreats in the summers. Up at 3 a.m., milking, skimming, poring over the fields for stray wild garlic, afternoon naps, hearty meals, and then home again with some fresh whole milk. Sign me up! Or—at least—sign up my kids! We’ll never know how much full-fat dairy products would have benefited Tess in the long run because—spoiler—it’s a Hardy novel, and Tess doesn’t have a long run, but clearly diet and an active lifestyle kept her healthy and strong enough for cross-country escapes and some parkour at Stonehenge. I’ll say no more. Do read the book. It’s wonderful. I just read the most fascinating book. If you happen to like biology and history of science, which I do. Apparently a lot has been learned since I took AP Biology in high school (and, just to date me, one of my most vivid memories of that class is my teacher flipping on the television because the Challenger had just blown up). Meaning, we never learned about molecular phylogeny or horizontal gene transfer in the caveman days; nor am I going to explain those things in a blog post. But I did double-check with my own 17-year-old who just took his AP Biology class, and I'm happy to report my taxpayer dollars were at work. With a few probing questions I discovered he had learned about these new-to-me concepts. Knowledge marches on. Anywho. The reason I do bring all that up here is that (1) it was an awesome book, which I highly recomment, and (2) the author David Quammen did touch on antibiotic use in the meat industry. As you probably know, antibiotic use is widespread in Big Meat not because the cows and such are always coming down with pneumonia, but rather because folks noticed it helps the livestock gain weight faster. And faster weight gain equals less time to market equals cheaper meat for us consumers. As you probably also know, the world has a growing problem with antibiotic-resistant microbes, which the widespread application of antibiotics to industrial livestock only makes worse by leaps and bounds. In the caveman days (i.e., when I learned biology), we thought this was because of straightforward Darwinian natural selection: you hit the wee bugs with the antibiotics, and whatever survived lived to reproduce another day, and after awhile that was all that you were left with, the survivors. resistance to multiple antibiotics among bacteria spreads horizontally. It can happen by conjugation. It can happen by transduction. It can happen in a sudden leap. Consequently, it has become a dire problem. And the problem is especially severe in hospitals, where such huge volumes and such variety of antibiotics are used, selecting for resistant bacterial strains that then infect people who are already ill. 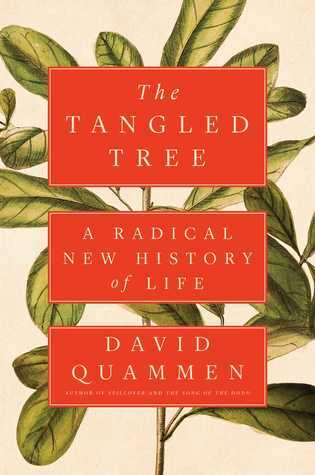 I had no idea before I read The Tangled Tree that resistance was a problem as early as 1955, when penicillin had been in use only from 1942 onward, or that MRSA emerged as a worldwide concern by 1972! And I had no idea that resistance could spread so rapidly through so many avenues, making natural selection look poky and harmless by comparison. Quammen blames the overuse of antibiotics on patients and on livestock. I can't help your hypochondria (except to urge you to let your healthy microbiota flourish as much as you can, rather than wiping it out with antibiotics unless you absolutely must), but I can encourage you to buy meat not produced by relying on antibiotics. Globally, total consumption of antimicrobials (that is, drugs against dangerous microbial fungi as well as bacteria) by livestock was roughly 126 million pounds, with China using even more than the United States, and Brazil in third place. Most of that total goes into cattle, chickens, and pigs. A significant fraction of it involves drugs that are also important in human medicine. ...So there's an extraordinary amount of evolutionary pressure, out there in the world, forcing bacteria to acquire resistance or die. But the most startling aspects of the trend have been how speedily resistance has spread and how many different kinds of bacteria have acquired multiple resistance--that is, resistance not just to one antibiotic but also to whole arsenals of different kinds. ...[The] intestinal bacteria of chickens, if the birds ate tetracycline-laced feed, acquired resistance to the antibiotic within a week. Less expected, more worrying, was that the bacteria in the bowels of farm workers on the same site acquired the same resistance over a period of months. How? It's complicated. Meaning, do read the book. Now, meat raised without antibiotics is more expensive. Of course, because it takes longer to raise. But I think most of us eat more meat than we need to, and once my teenage boy heads off to college, I plan on reducing the meat the rest of us consume significantly. If we reduce overall meat consumption, then the meat we do eat can be better meat. Pastured. Raised without antibiotics. Ask our Market farmers how they raise theirs this week. And grab some vegetables, while you're at it. This book didn't mention it, but other gut books have: the best way to keep nasty bugs from taking hold in your gut is to keep all the good bacteria prosperous, numerous and healthy. And that takes lots of vegetables and fiber. Oh, and try not to touch anything or have any open wounds the next time you're in a hospital. I know, I know. Real cooks don't need recipes. But I think people who are able just to whip something up with ingredients on hand have never been a dime a dozen, and I'm betting the skill has become rarer than ever now, given how few people actually cook. The only things I wing nowadays are smoothies and salads, and while the smoothies are mostly fine (n.b. 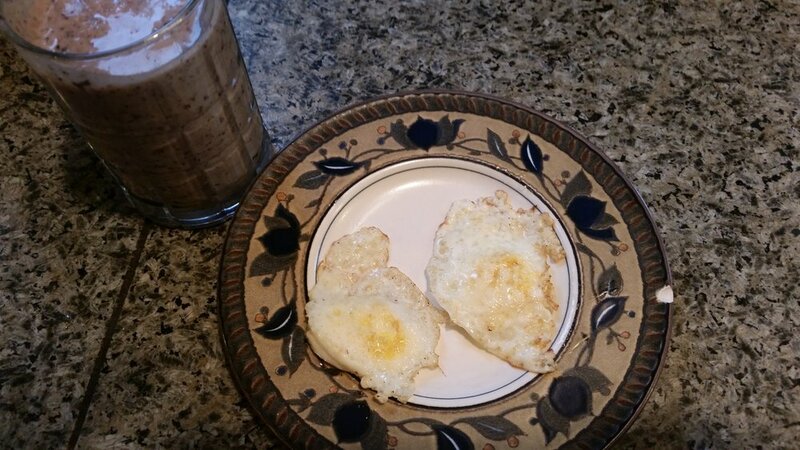 : adding avocado means your smoothie will turn an unappealing gray if it sits for any length of time), the salads are never as good as ones I've made with a recipe. Anyhow, we had two delicious things this week that you probably wouldn't just whip up on your own, even if you had that talent, and since 'tis the season for the ingredients, I didn't want you to miss out. The original recipe called for it to be served with cooked chicken in soft tacos, which is how we ate it, but it made so much salsa that I had it the next day on scrambled eggs, and my husband just packed the rest for lunch and ate it as is. It's that delicious! Toss the potato slices in the oil and garlic and salt and pepper. Spread in a single layer on a cookie sheet and bake 350F for 10 minutes or until tender. Set aside. Roll out your pizza dough (I also use her recipe, but pick your favorite) and spread with the remaining oil/garlic mixture. Arrange onion slices over dough and sun-dried tomatoes. Top with potato slices and cheeses. On the very top, put your sliced fresh tomato. I baked this on a pizza stone in the oven at 425F for about 15 minutes until the top was golden brown. SO good! If you wanted, you could even skip the sun-dried tomatoes and go with fresh. She also recommends a sprinkling of fresh sage, but I didn't have any. The time is now, people. The food is now. Get out there and eat like fall is coming! At least we were able to provide some Schadenfreude for the rest of the country, to the tune of, we may have to deal with humidity/crazy temperatures/hurricanes/thunderstorms, but at least we can breathe our air. Not to mention how Beijing must feel: See? You try to put on an Olympics with air like that! No. Thursday our blue skies will begin to put in an appearance, and I doubt a single complaint about the temperature dropping to 70F will be heard anywhere in the region. And where better to rejoice than at the Market? All that smoke in our lungs makes us yearn for something crisp and healthy. Have you noticed it's tomato time? And temps in the 70s mean you could even have a warm tomato soup and a grilled cheese sandwich and salad for a perfect meal. 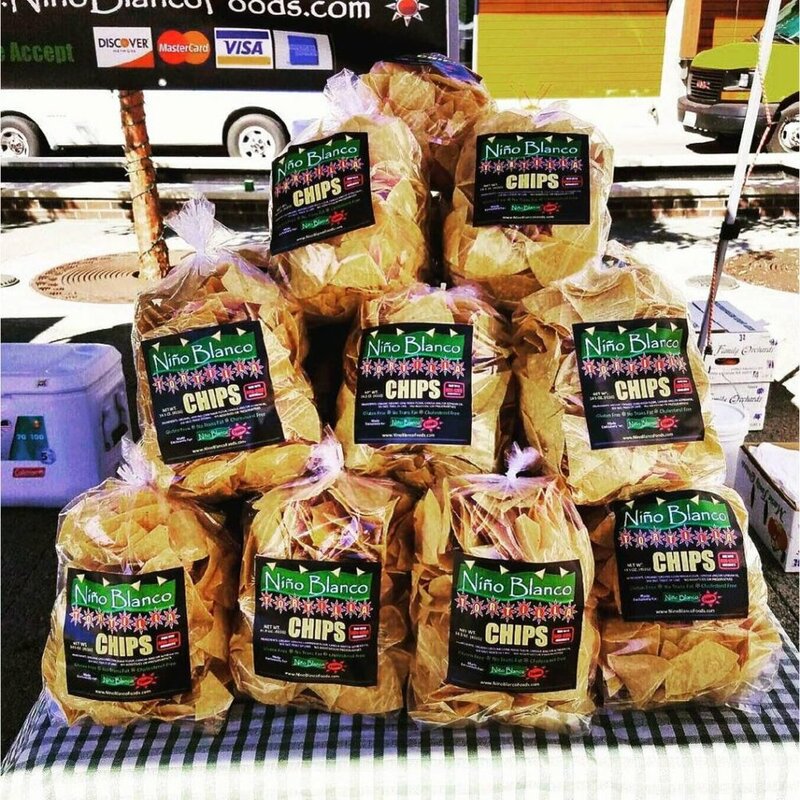 And don't forget your homemade pico de gallo with Niño Blanco tortilla chips! See everyone tomorrow, mask-free and breathing more easily. Do you ever find yourself buying or not buying things because of the packaging? I only buy grapes at the store maybe once a year because I hate those new, non-recyclable plastic bags they put them in. I buy the giant-est natural peanut butter because it comes in a glass jar and isn't pre-mixed with other fats. I buy mustard in glass bottles. Relish. I tried to buy the yogurt that comes in glass, until the price broke me. I hate buying bags of salad greens (non-recyclable), squirm when I see potluck offerings in storebought plastic containers, and light up with delight when I see unpackaged foods, or produce in cardboard containers. As if I needed another reason to love most of the offerings at the Market. Yes, some plastic is recyclable, and you can find what to do with which form of plastic on King County's website, but even recyclable plastic can only move "down the chain." It can only be re-made into something else, not the same thing again. That's why all those plastic containers become fleeces and fake-wood for decks and furniture. I love how some of our berry farmers offer $1 off your next purchase if you return their bigger cardboard carriers (if only I could remember to bring them). And I love my reusable mesh produce bags, of which I don't have enough, and which can also double as a "delicates" bag to go through the laundry. These can be found online or at certain grocery stores. and I suspect 500 years might be optimistic--why not save plastic for making things that we'd like to have around for 500+ years? It must have been bought by or given to my husband's grandmother because it's that super lightweight, translucent early plastic (celluloid) that would probably go up in flames. One of a pair that used to reside in my mother-in-law's hutch. 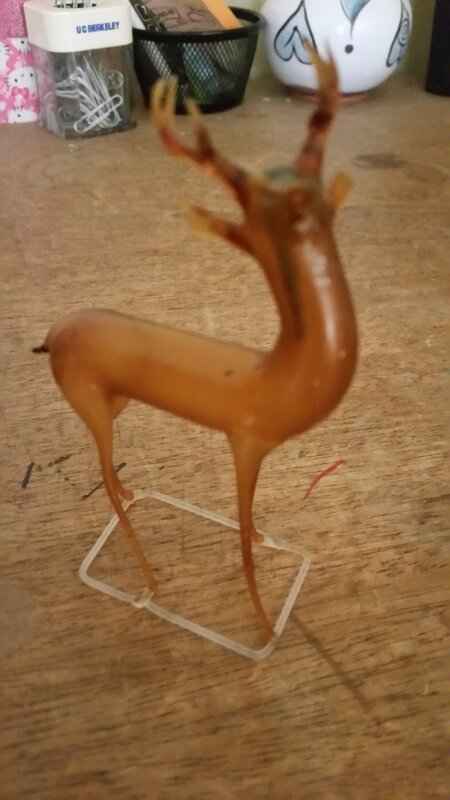 The other deer must have gotten crushed and will spend the rest of its remaining 400+ years in pieces in the landfill. 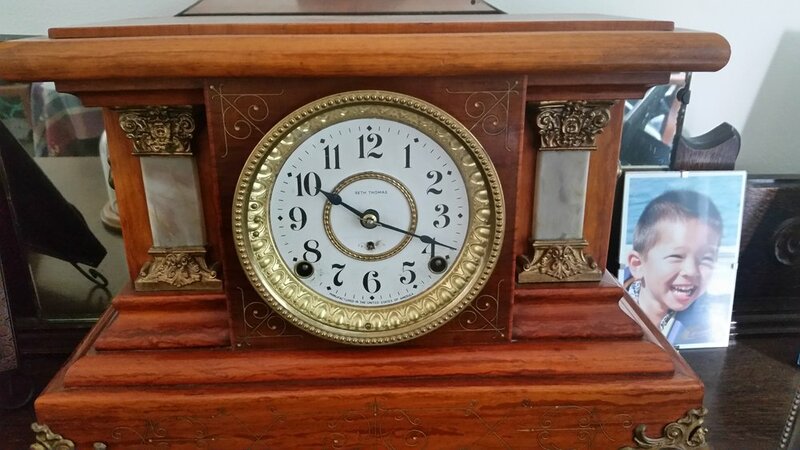 See the faux marble on either side of the clock face? Plastic. From around about 1895. Plastic can be marvelous. Its longevity can be a good thing. Just not the way we use it now. As I look out on another smoky day on our not-very-disposable earth, I think the little choices we make, the little differences we make, continue to be so very important. Reduce - Reuse- Recycle, these things remain. But the greatest of these is Reduce. 'Tis the season for everyone to go on vacation. We may have perfectly delightful weather and sunshine here, but we feel the need nevertheless to trade all that sun and blue sky for a place with sun and blue sky and air-conditioning. But if you haven't left town -- or if someone has decided to visit you -- great food at the Market continues. Nay, even increases in bounty. It's the time of year for every fruit you could possibly want, for making jam, pies, cobblers, crisps, for freezing, for grilling, for canning, for just eating out-of-hand. Our farmers have discovered that, if they plant varieties of strawberries that last into August, we will buy them. And salad fixings have never been better, especially if you want to take a break from greens to go with a chopped salad. Peas, green beans, cucumbers, potatoes, tomatoes, corn, melons, onions -- they were all there last week. Or how about a baked potato bar? The Market has those potatoes, cheese, scallions, and bacon. And, if you do the potatoes in the crock pot, it doesn't heat up the house. If you're reading this, celebrate your staycation with another al fresco meal. Take those friends and family to the Market after you pick them up at the airport on Thursday. Grab dinner there and grab Friday's and Saturday's dinner fixings as well! Scrub potatoes well. Dry. Prick them with a fork several times. Then rub each potato with some butter and place them in the slow cooker. Cook on LOW for several hours, depending on the size of your potatoes and how many you stuffed in the pot. I had four decently-sized potatoes, so I put them in at lunchtime and they were very ready by 6pm. Split and serve with butter, sour cream, shredded cheese, bacon bits, and chopped scallions. On the side, serve a chopped salad and sliced, fresh melon. I just finished reading Wuthering Heights for the second time, as I prepare for a 19th-century British Novel class I hope to teach this fall, and, would you believe, in that whole book there are plenteous mentions of eating and drinking, but nothing specific is mentioned? I counted tea (several times), "boiled milk," bread, and coffee. How everyone managed to storm about, braving the elements, nature, the cosmos, and eternity, on such a meager, mostly-liquid diet is a mystery to me. Our Market offers more substantial beverage offerings, I'm happy to report. Ones that probably could have kept the first Catherine Earnshaw Linton above ground longer to drive everyone mad. Kombucha is fermented sweet tea, meaning its got plenty of yeast and bacteria for gut health, along with tasty flavors like ginger, peach, cayenne, and "passion." I'm betting Catherine and Heathcliff would've gone for the spicy varieties. I can't imagine Edgar Linton drinking fermented tea, however, and I'm betting his gut was always upset because of his wife's volatility. If kombucha isn't your thing either, you may have wandered by the lovely display of Finnriver Ciders. You'll find plenty of varieties of traditional hard apple and pear ciders, along with adventurous blends that include herbs or spices. (A little Habanero Cider for Heathcliff, perhaps?) And then there are the dessert wines. Annoying, consumptive Linton Heathcliff might have benefited from a glass of "Spirited Blackberry Wine," but I doubt anyone who's read the book wanted that character to hang around a moment longer than necessary. 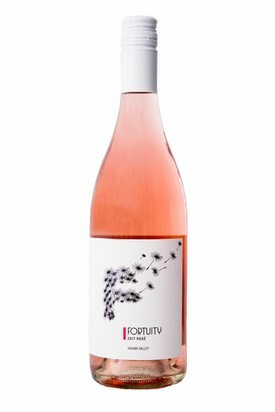 More traditional wines can be found at Fortuity Cellars and Wilridge Winery. The lovely summer evenings call for a rosé or pinot grigio. Certainly the characters in Wuthering Heights suffered from too much isolation and would have benefited from breaking open a bottle of wine together, in any season. As the frame narrator Lockwood calls their corner of Yorkshire "a perfect misanthropist's heaven," no wonder everyone wanders around in snow, ice, rain, and cold, cut off from each other and harboring tuberculosis. At the risk of sounding Nelly-Deanish, with her prosaic advice toward living a normal, healthy life, I invite you all in from the storms and rages of existence--make a visit to the Market this week for a glass of community, health, and welcome connection. If you're anything like me--that is, air-conditioner-less--the meals you've been planning lately do not involve the oven and limit the stovetop. We've been doing lots of grilling and slow-cooking and salad-ing, and fortunately the Market has just the right supplies for the heat wave. Meat and fish. You don't need fancy marinades. Some olive oil, salt and pepper and you're good to go. Although today I have a flank steak marinating in teriyaki sauce, olive oil, mustard, hot sauce, onions, and powdered ginger. Okay, our Market doesn't have a playground, but this was a good shot of the beans. And, of course, glorious fruits and vegetables. The combination hardly matters. I love greens with berries or chopped nectarine. There's corn and green beans. Fresh radishes. Tomatoes galore! If you don't eat them raw, the produce is usually grillable, laid straight on or in foil packets with olive oil, salt and pepper. A friend prepared onions and thinly-sliced potatoes that way, and it was delish. Thursday's forecasted high is 88F. Don't forget your hat and sunscreen when you come by the Market. And, if the thought of any sort of cooking is just too much, there are always our lovely food trucks and pizza and tamales and ice cream and slushies! You would think, living in western Washington, that the growing of corn was only for fall corn mazes. The kids'-amusement version of growing corn for ethanol. We tried growing some one year in the front yard, and it was pretty much a total failure. Thankfully come of our farmers get a little more solid sunshine and actually manage to grow very tasty sweet corn, which hopefully we will find this week at the Market. We are ready. Ready for plain boiled corn, grilled corn, corn salad, and corn cakes. Combine 1 cup cornmeal, 1/2 cup flour, 3/4 tsp salt, and 3/4 tsp baking soda in a large bowl. In another bowl, melt 2 Tbsp butter and whisk in 1 egg and 1 cup buttermilk. Combine wet and dry mixture and stir just until combined. Then stir in 1 cup cooked corn, 1/2 cup diced onion, and 1 cup shredded cheese. (I used half cheddar, half pepper-jack.) Heat a little oil over medium heat in a skillet. Drop the batter in, 2 Tbsp at a time, and fry a couple minutes on each side until browned. Keep warm in a 200F oven. Serve with sour cream. We've had these corn cakes a couple times, only seasonally, with fresh corn, and they are devoured! We had kebabs alongside, but everyone's favorite was the corn cakes. And my oldest daughter didn't even pick out the onions. The other big item on this week's shopping list would be blueberries. It's that blueberry-pie making and blueberry-freezing time of year, folks. Preheat oven to 350F. Grease a 9" pie dish. Toss berries with 1/4 cup brown sugar and the 1 Tbsp flour and spoon into dish. In a medium bowl, rub remaining 1 cup flour with diced butter until it forms coarse meal. Mix in remaining brown sugar, milk, egg, lemon peel, and vanilla. Blend and pour batter over blueberries. Bake pudding about 55 minutes, until top is golden and the center isn't jiggly. Let cool 10 minutes and then serve with ice cream. Growing Washington's Blackberry -- check out those ingredients! Well might he marvel. 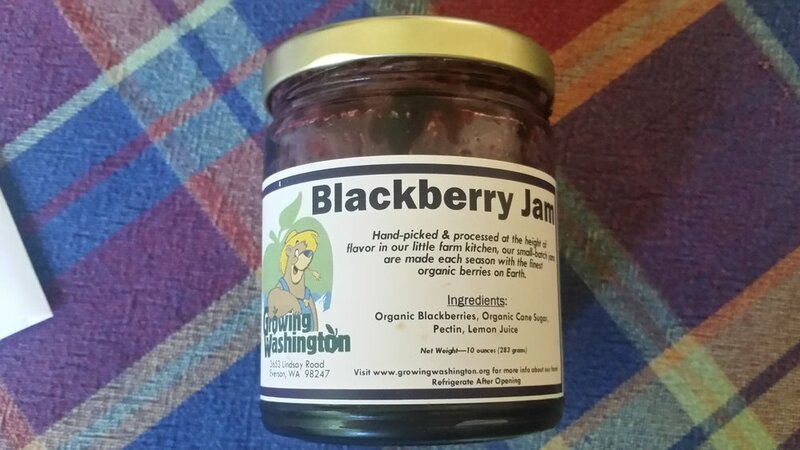 Compared to the jar of Hero "Blackberry Premium Fruit Spread" I'd bought in the off-season (on sale at Bartell's), Growing Washington's jam contained only four ingredients, and blackberries were Number One. Hero's listed sugar first, then fruit, and then "wheat syrup." What the heck is wheat syrup? It turns out it's a highly-processed sweetener from wheat starch. So, while the jar could brag it contained no high-fructose corn syrup, it was really only because they'd substituted another processed sweetener. No one has touched the Hero's jar since the real deal appeared. To be honest, her jam is pretty expensive, but I like to support her efforts, and she does offer some varieties I haven't seen at the Market. But not everyone has a Lynn in his or her life, so the next-best option is Market jam. The only catch? Once you start on real jam, it's hard to go back to the storebought stuff. And if you're a maker of jam, have you seen the fruit coming in? It's bounty time, people. Berries and cherries and soft fruits galore. Stock up. Stuff your face. Make jam. Make pies. Freeze extras. I know I write too much about fruit. I promise: more vegetables and other items next week. Maybe. In the meantime, I leave you with sweet peas. Here's wishing everyone has a barbecue planned, to celebrate. If you've been asked to bring something, I hope you set aside some berries from last week's Market! They come in such patriotic colors, after all. Ladies and gentlemen, I give you an army of tayberries. If you're a lover, not a fighter, the Market has a tie-dyed rainbow of goodness for you this week because, as well all know, summer in Seattle starts on the 5th of July. 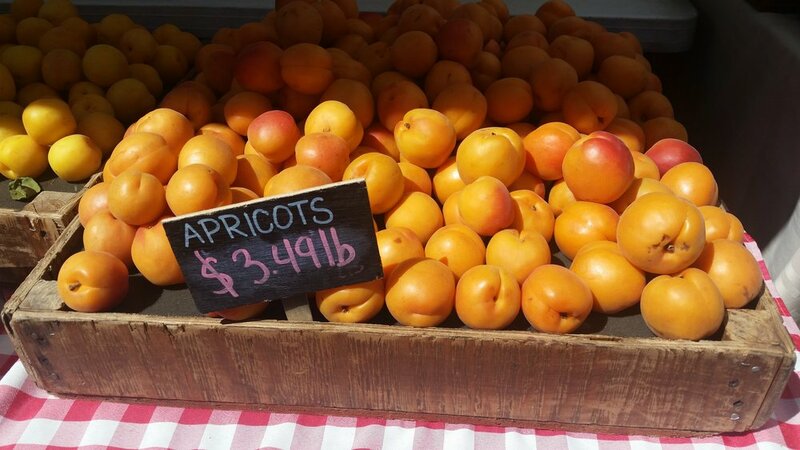 Multi-colored berries, sugar snap peas, tomatoes, roasted peanuts, cherries, the FIRST PEACHES(!!! ), chickens, eggs, bacon, purply wines and amber-y ales and milky probiotic-y drinks. Like our great country, there's room for all colors and varieties, and we're all the richer for it. Eat up and enjoy! Scene: Winter. A mom and her teenage daughter are pushing a cart through the grocery store. Teenager: Yum! Can we get some strawberries? Mom: [repressing a shudder as she eyes the clamshell containers of giant strawberries from California] Those things? They don't even taste good. They breed them for size and color, not for flavor. Teenager: But they're good anyhow! I've had them. Mom: You're the same person who likes cake mix cakes that don't even use real vanilla. Scene shifts to summer at the Bellevue Farmers Market. Teenager: Strawberries! Can we get some? Teenager: And not just two pints this time. That doesn't even last one day. Teenager: Of really big strawberries. Mom: I like the little ones better. They have more flavor. They're like sugar bombs. Teenager: But I like the big ones! Mom tyrannically buys a half-flat of small strawberries, and teenager seethes and thinks rebellious thoughts. 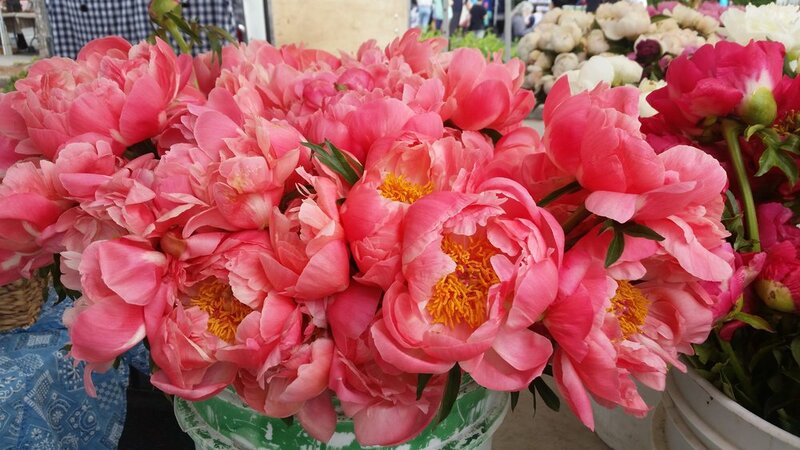 Maybe you've chosen your favorite variety already, from the many offered by our farmers. We not only ate our tiny ones raw, but we also turned them into strawberry shortcake. 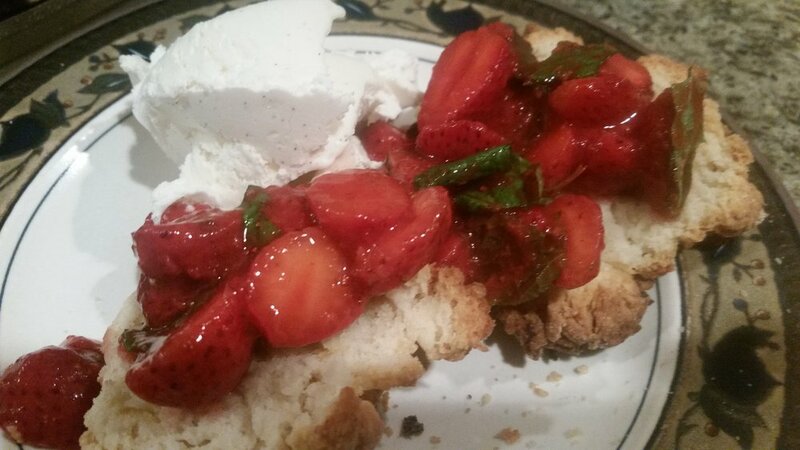 Kind of a poignant thing because my husband took a bite and talked about how his mom (now in memory care for dementia) loved strawberry shortcake and used to make it often. Waaah! Clearly we are going to have to bring her some. She may not remember what we remember about her love for strawberries, but she can discover them anew. Slice two baskets of the strawberries and transfer to a large bowl. Puree the remaining basket in a food processor until smooth. Add to sliced strawberries. Stir in sugar and lemon juice. Garnish with mint, if you like (I don't like). Halve biscuits and spoon topping generously over. Makes 8 servings. 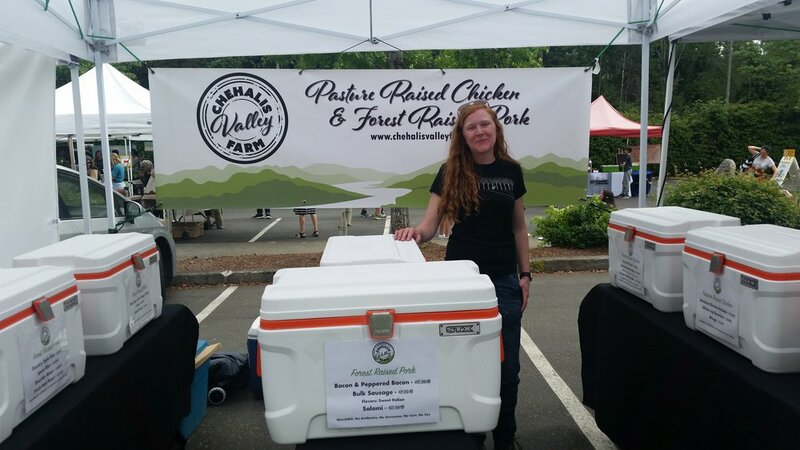 Supposing you take a break from opening and closing windows in your house, positioning fans, and looking for a cool spot on the bed sheets, and head to the Bellevue Farmers Market! There was an old Coca-Cola ad that used to run when I was a kid: during the heat of summer, they would show people frolicking in the snow. Along those lines, I thought I'd refresh you all with some heat-relieving Market offerings. If you haven't tried Seattle Pops yet, they're luscious, not to mention seasonal, fresh, and local. Better yet, they have a punch card, to encourage you to try every one of their tempting flavors. Whether you favor pear- or apple-cider slushies, they're worth the brain freeze. You may have inexplicably missed Solstice in Fremont this year (or you were too busy parading to stop in at the store), but that doesn't mean you still can't sample Bluebird's wares. 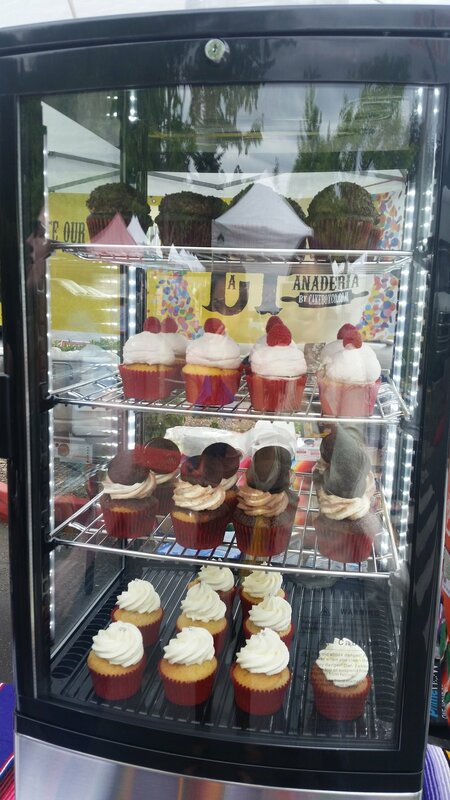 Pair a cupcake with one of their agua frescas and you're good to go.  Apparently, everything from road rage incidents to bench-clearing baseball brawls goes up during hot weather, so keep the peace by keeping your cool, Bellevue. 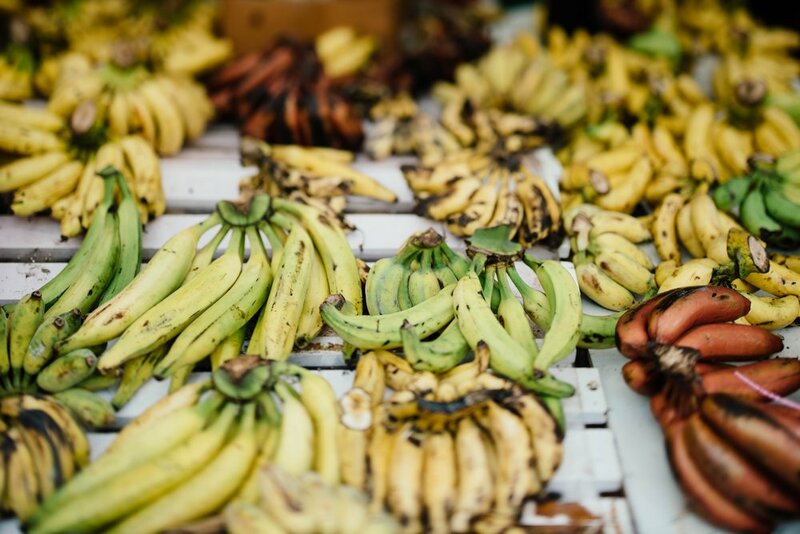 Rain or shine, heat wave or cold snap, we'll see you at the Market tomorrow. If you're a regular at the Market, you know you run into the same faces a lot. Since my youngest and I have been coming like clockwork for years, we've passed through the adolescent stage where she said, "Oh, no! There's that person from school!" to where she can actually smile and say hello without the asphalt cracking open and swallowing her, mortification and all. So, if you're not a mortified adolescent, you've begun to enjoy running into friends and acquaintances and asking them, "What's in your basket?" Yes, I'd had Niño Blanco's excellent fresh salsas (their pico de gallo is the best I've had, outside of our homemade, Deborah-Madison-recipe version, which we can't make till my husband's tomatoes come in, in August), but I'd never even noticed the chips until a friend said they were the best, and they bought them every week. We took their recommendation and bought our first bag. For one thing, they're organic, and, for the same price or less ($4 for 14 ozs), they taste so much better than any organic tortilla chips at the store. They're crisp, flavorful, perfectly salted. The only problem is, they taste so much better that we ate the whole bag in less than a quarter of the usual time. Especially because we paired it with fresh pico. Yowza. That still won't stop me from getting another bag this week. Then there were the friends who raved about the "yellow beans" at Alvarez Organic Farms. Frustratingly, I totally forgot to take a picture or even get the beans' real name, but the testimony is, "The beans are so flavorful and hold their shape well and puff up nicely in soup." They also cook up as quickly (for beans) as black beans--maybe an hour or two on the stove. I did make a new acquaintance last week, a mushroom-lover hovering by new farmers Skagit Mushroom Company. These fellows from Mount Vernon farm various mushroom varieties, including Shiitake and these ruffly kind, which my new acquaintance sautés in butter. I don't happen to have mushroom-lovers in the house, so we opted for the darling quail eggs. Check out these miniature fried eggs! 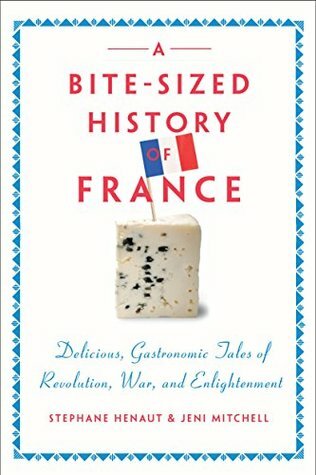 I've been reading this fun little book called A Bite-Sized History of France, which I warmly recommend to any of you out there who love food, France, and fun little facts. Today the Ban des Vendanges [date which the wine grape harvest can officially begin] is mainly an occasion for celebrating and promoting wine, but it remains a minor administrative hassle for vintners if they want to harvest any earlier. So, all in all, the Ban des Vendanges is very French, as France is traditionally a big producer of both wine and administrative hassles. As the title suggests, the authors proceed chronologically through the great country's history, seen through the lens of food anecdotes. Along the way, I learned how food became a marker of social class in the Middle Ages. Because most vegetables were grown and consumed by peasants, to supplement their meager diet of whole grains and infrequent meat, "nobles shunned most vegetables, especially root vegetables, which grew underground." The same nobles also pooh-poohed fish, associating it with Catholic fast days. They wanted lots of meat, especially game (because of its warriorlike association with hunting) and fancy birds like heron, swan and peacock. And at the top of the desirable-menu-items list? Phoenix and salamander. If only they weren't so hard to find! Such a rich diet among the nobility made diseases like gout and cardiovascular problems common, and it's not like bossing peasants around burned many calories, in between crusades. At least, for all the bummers of feudalism (like oppression, disease, overwork, and always having to hand over the lion's share to the Man), those peasants got their exercise and ate healthy when food was to be had! And since, as the book points out, 95% of France belonged to this Third Estate, they had hundreds of years to get in shape for the Revolution, when they could chop off the heads of the First (clergy) and Second (nobility) Estates. (I'm not done with the book yet, but I really hope I get to a chapter titled, "The Peasants Strike Back, a.k.a., the Reign of Terroir." took as their mission defending Christian-won sites in the Holy Land after workaday Crusaders headed home. So they combined monkish habits with other, decidedly unmonkish habits. The diet of the Templars very much resembled that of other monks, but they were allowed to eat meat three times a week. It is actually thought today that their restrained eating habits, which involved lots of vegetables, fruits, and fish, were responsible for the noted longevity of Templar knights, which back then was seen as a sure sign of divine approbation. My mom tells me that my stepdad has been diagnosed with a precancerous growth in his intestine, which gave me a chance to climb on my soapbox and urge them to eat like peasants and Templars. Vegetables, vegetables, vegetables! Fruit, fiber, fish, whole grains! Throw away the processed foods when he's not looking! Me: Are you having an okay time? Is it cool? Is the food any good? Him: It is cool. The food is pretty good. Him: The food is sponsored by McDonalds and Coca-Cola. McDonalds and Coca-Cola?! We are feeding the future athletic representatives of our country food sponsored by McDonalds and Coca-Cola??? Sure enough, when I quizzed him later on the fruits and vegetables on offer there, he said there wasn't much fruit, and the vegetables were greens, by which he means lettuces and an (I'm sure) uninspiring salad bar. Well, that's disappointing. I guess you go there in order to train at altitude, not to eat the food of champions. No wonder some of them resort to PEDs. 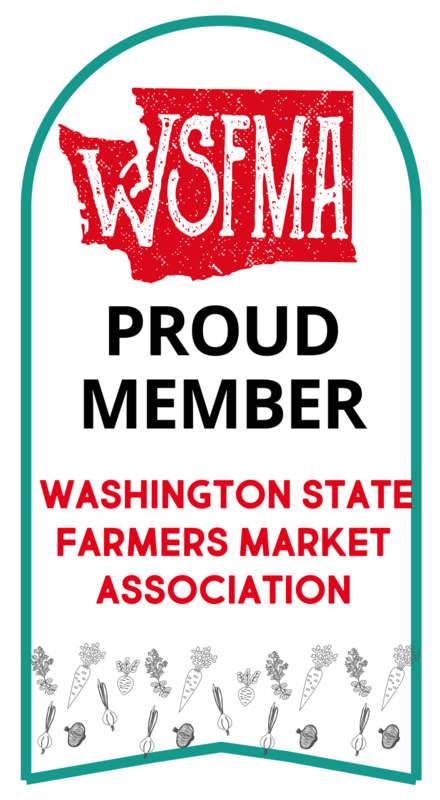 How fortunate we are, I say for the hundredth time, to live in Washington State and have our ready access to fresh produce of all varieties. And we want to pass this appreciation on to the younger generation. The Sidhu family farms in Puyallup, growing all sorts of goodies, including the berries, rhubarb, and plant starts you see here. They even keep bees and offer honey! If you've been admiring the rhubarb at the market and wishing you could make a strawberry-rhubarb pie, they've got the frozen strawberries to help you realize your dream. If you've never had açai, it's the star food of the hour, a palm tree berry that looks like a blueberry. Like blueberries, they're packed with good stuff like antioxidants and fiber. Unlike blueberries, they're trendy and foreign and therefore expensive. Everyone should try açai because all new foods should be tried, but feel free to be out of style and eat run-of-the-mill berries for the same benefits, if açai doesn't blow your mind and taste buds. Don't eat like an Olympian this week! Put down the Big Mac and Diet Coke and swing by our Market Thursday for the real food of champions. Hope everyone got out to the Market for Opening Day! But the good news is, the season is on, and each week will bring new delights. In the excitement, did you catch some of the new additions to our Market? which should win a prize just for some of the names of its offerings. Although we didn't get to try any this week, we were particularly delighted by "Pig in the Orchard." In fact, pigs in fun places was kind of a theme, as we discovered when we stopped to chat with Chehalis Valley Farm, home to Pig in the Forest, a.k.a. "Forest-Raised Pigs." What exactly is a "forest-raised" pig? Exactly what it sounds like. Like their wild boar cousins in the southern United States (who also began life as domesticated pigs, once brought by European explorers), these little porkers live life to the fullest, roaming around their woods, doing piggy things like digging and foraging and hanging in the shade. Pigs free to do piggy things and to eat piggy things leads to tasty pork for us. I've got some sitting in my freezer right now, and we've already enjoyed one of their pastured chickens. On the new and exotic side, I spied...locally-grown saffron??? Moving from the exotic to the girl next door, did you come across Neighbor Lady Cheese? Thanks, Wikipedia, for the shot of "Romanesco broccoli." If you love to grow your own goodies, don't miss these. I'll keep the discoveries coming this week! 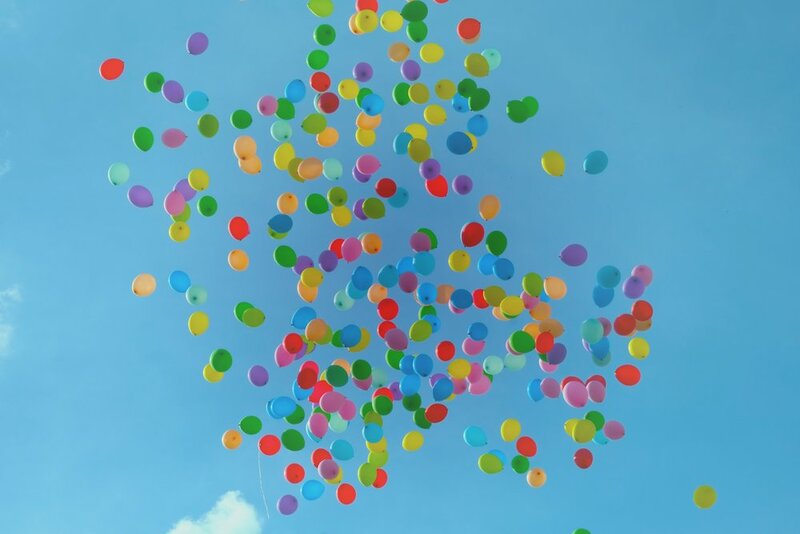 If you're at a moment in time where you find yourself saying, "Tell me something good," I'm delighted to come through. Because, hot diggety, folks, the Market opens tomorrow, Thursday, May 17th! A thrilling combo of favorites and new temptations! Greens, greens, greens! Spinach, beet greens, chard, what-have-you. It's hard to think of a food that's more universally recommended as good for you, and I've landed on the ways all members of my family will eat them. In smoothies. In salads with very flavored dressings. Sauteed into a potato-onion hash. Jam. Now that my mother-in-law can no longer make her homemade strawberry freezer jam and we've run through the jars of jam other jammers have bestowed on us, we are desperate for some Market jam. Made with that good Washington fruit. You might have noticed that, just as storebought fruit pies are terrible--almost all crust and goo-- storebought jams never taste anything like summer in a jar. 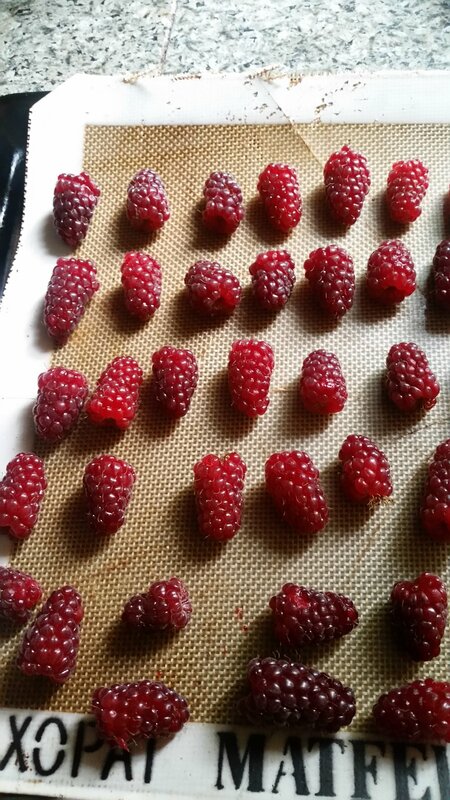 We love Growing Washington's raspberry jam, so this year I'll stock up and give some other flavors a go. Asparagus. You haven't had asparagus till you've had local. Nutty, fresh. Meat and tuna. We're down to one can of Fishing Vessel St. Jude's, and it's not even my new favorite, Jalapeno. And, as for meat, it'll be nice to have more cuts and offerings of pastured meat available than I can find in the grocery store. Plant starts? Can't remember if these are around the first week, but my youngest, who is our little farmer, has promised to plant and tend an herb garden for me again this summer, if I buy her the starts. Peas. Nothing says spring like peas! Raw or steamed or in a stir-fry. Never met a pea I didn't like. And while we gather these goodies, I'm sure we'll be grabbing a snack. Always so hard to choose at the beginning of the season! An old favorite, like Veraci Pizza or a bao from The Box? Will it be warm enough for ice cream? Or should we try something altogether new? See everyone this Thursday! Same Bat time (3-7pm), same Bat place (parking lot of Bellevue Presbyterian Church)! 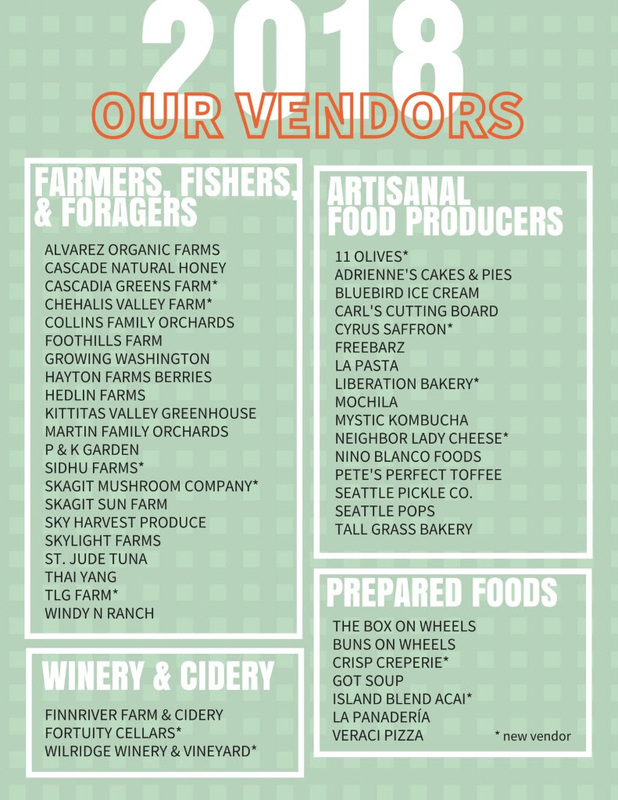 Less than ten days until the Bellevue Farmers Market opens for the season on Thursday, May 17! We recently had some folks to dinner who hailed from southern California, and the wife said it took some adjusting to move up here and "eat seasonally." I did wonder what grocery store she went to, since all the ones I know subscribe to the "it's summer somewhere" mindset. Strawberries and blackberries midwinter? No prob. But maybe she meant she likes to eat locally wherever she finds herself. In that case, yes, seasons matter. And we are entering the most wonderful time of the year, eating-wise! (If you're wondering about the other two products, they're hay and hops, and I guess you could argue that hops are available in the beers you can buy at our Market.) How lucky we are that our farmers grow a variety of crops, so that, when the "season" hits, our seasonal eating is so rich. Two weeks till the Market opens! With a mother-in-law suffering from Alzheimer's (and the whole rest of the family suffering as a by-product), I'm always interested in what will keep our brains sharp. Exercise, yes (yuck), but also those dark, leafy greens! (You may also say yuck to that, but I'd rather eat kale than work out.) NPR reported on yet another study linking eating our greens to keeping our gray matter. The bottom line? "Healthy seniors who had daily helpings of leafy green vegetables — such as spinach, kale and collard greens — had a slower rate of cognitive decline, compared to those who tended to eat little or no greens." What constitutes a serving size? Half a cup, cooked, or one whole cup, raw. The link isn't completely understood or established yet, but it does seem that all the folate those greens provide help lower homocysteine levels in the body, leading to less arterial plaque. High homocysteine levels are tied to cognitive decline. Let's be strong to the finish 'cause we eats our spinach. 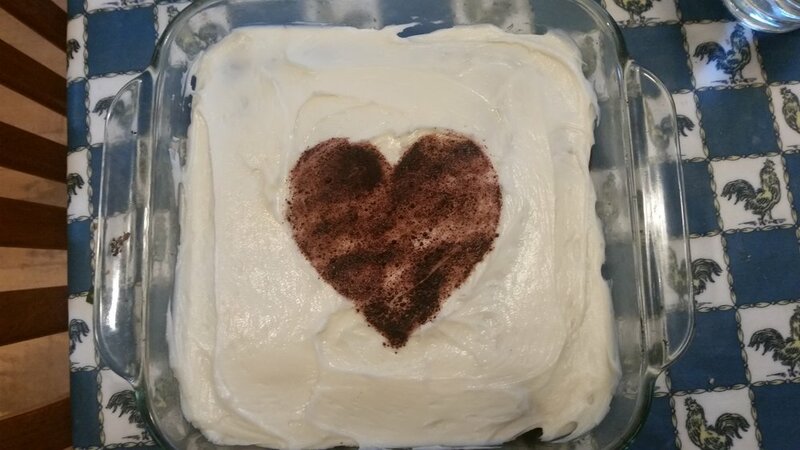 Perhaps it's only fitting that tonight I have to provide a dessert, and I'm making a banana pudding, the world's best totally-artificial dessert. Meaning, when I had it as a kid, it involved a box of Nilla Wafers, a couple boxes of vanilla pudding, bananas, and a container of Cool Whip. I know I've written about banana pudding here before, somewhere in the annals, but some things are worth repeated efforts to perfect. You cannot get rid of the boxed Nilla Wafers. I've tried a couple homemade "vanilla wafer" recipes, and neither one tasted like the boxed version. There's something about those dumb things (that are also pretty danged expensive, considering their cheap, fake ingredients) that cannot be matched at home. Their beautiful uniformity. How delicious they tasted dunked in a glass of milk. Their perfect texture when they soak up the vanilla pudding. Even the Trader Joe's versions don't do it for me. Cool Whip, on the other hand, is gross and totally replaceable with whipped cream, sweetened to your taste. Boxed pudding is also perfectly replaceable, you just have to make sure to thicken it enough. Today I'm giving this recipe a try. Easy peasy, and the guests can dig in. But family members, on the other hand will have to plow through the greens to get to the gold.